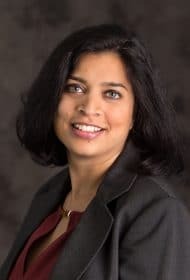 Stuti has 12 years experience consulting public and private companies on a broad range of executive compensation and director compensation matters. She joined Meridian from PepsiCo where she was an executive compensation manager and worked on various aspects of the executive compensation program. She also has experience working with global clients on various other consulting offerings such as compensation and benefits survey studies, employee engagement and best employer studies. She consults clients (including Fortune 100 companies) in various industries such as retail, diversified financial services, semi-conductors and insurance. Stuti is also the lead on Meridian’s Outside Director database and the annual Fortune 100 Outside Director Compensation report.